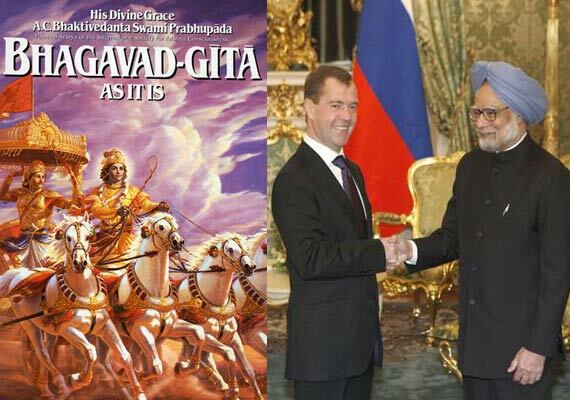 A Russian court in Tomsk is going to give a verdict TODAY banning Hinduism's most revered book Bhagvad Gita, and ISKCON devotees across Russia and India have appealed to Prime Minister Dr Manmohan Singh to raise the issue with the Russian leaders. Bhagvad Gita is facing a legal ban and the prospect of being branded as ‘an extremist’ literature across Russia, with the court in Siberia's Tomsk city all set to deliver its final verdict on Monday in a case filed by state prosecutors. The case, which has been going on in Tomsk court since June this year, seeks to get a Russian translation of Bhagavad Gita As It Is written by A.C. Bhaktivedanta Swami Prabhupada, the founder of the International Society for Krishna Consciousness (ISKCON), banned in Russia and declaring it as a literature spreading ‘social discord’, apart from rendering its distribution on Russian soil illegal. Nearly 15,000 Indians settled in Moscow, and followers of the ISKCON religious movement here have appealed to Manmohan Singh and his government to intervene diplomatically to resolve the issue in favour of Bhagvad Gita. "The case is coming up for a final verdict on Monday in Tomsk court. We want all efforts from Indian government to protect the religious right of Hindus in Russia," Sadhu Priya Das of ISKCON and a devotee of a 40-year-old Krishna temple in central Moscow, told the media. The court, which took up the case filed by the state prosecutors, had referred the book to the Tomsk State University for ‘an expert’ examination Oct 25 this year. But Hindu groups in Russia, particular followers of the ISKCON, say the university was not qualified, as it lacked Indologists. The Hindus had pleaded with the court that the case was inspired by religious bias and intolerance from a majority religious group in Russia, and have sought that their rights to practice their religious beliefs be upheld. The prosecutor's case also seeks to ban the preaching of Prabhupada and ISKCON's religious beliefs, claiming these were ‘extremist’ in nature and preached ‘hatred’ of other religious beliefs. "They have not just tried to get the Bhagavad Gita banned, but also brand our religious beliefs and preachings as extremist," Das said. In the Nov 1 letter, addressed to Principal Secretary to the Prime Minister Pulok Chatterji, ISKCON's New Delhi branch Governing Body Commissioner Gopal Krishna Goswami, said the prosecutor's affidavit claims Lord Krishna ‘is evil and not conforming to Christian religious view’. Goswami also urged Singh to accord priority to the matter during his Moscow stay and to take it up with the Russian authorities. Indian diplomatic corps officials at the embassy in Moscow said that they have been following up the case since the time it was brought to their notice earlier this year and that they had also taken up the matter at the appropriate levels in the Russian government to get the case either withdrawn or get the defence to fight the case to obtain a favourable verdict. Officials at the Indian Prime Minister's office, who are part of the Indian delegation accompanying Singh, confirmed the case and the letter they received from ISKCON in this regard. "This matter is receiving the highest attention and the Indian embassy officials in Moscow have been instructed to follow up the case with the Russian authorities," they said.